Alessandro began his career in Brescia, in Italy’s north, working at Carlo Magno with the famous Iginio Massari and Giuseppe Maffioli. After working in various Michelin star venues such as La Rotonde in France and the two Michelin starred Villa Fiordaliso on Lake Garda, Alessandro broadened his culinary horizons working in Bermuda at the famous Restaurant Lido before moving to Sydney permanently in 2003. 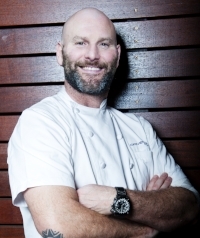 He assumed the role of Executive Chef at the Park Hyatt in 2005, managing a team of over 30 chefs. In 2009, Alessandro’s dream of owning his own restaurant became a reality with Ormeggio at The Spit. Ormeggio at The Spit has been a hatted restaurant since opening, achieving national acclaim in 2011, appearing on Australia’s most loved cooking show, MasterChef. It is currently listed as #23 on Gourmet Travellers Top 100 Australian restaurants. Alessandro is now enjoying the challenges and responsibilities of being both Executive Chef and Managing Director of the four venues within the Ormeggio Group: Ormeggio at The Spit, Chiosco by Ormeggio, Sotto Sopra and Via Alta.